Diesel Exhaust Fluid – H. N. Funkhouser & Co.
BlueDEF Diesel Exhaust Fluid is the mixture of high purity synthetic urea and deionized water that is used in Selective Catalytic Reduction (SCR) systems on diesel engines. 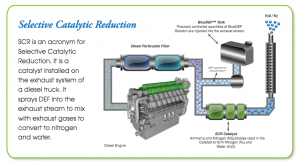 BlueDEF is injected into the exhaust stream via controlled dosing module where the water vaporizes leaving ammonia molecules free to travel into catalytic converter where it reacts and neutralizes the NOx molecules, converting it to nitrogen and water. BlueDEF is carried onboard SCR-equipped vehicles in specially designed tanks and is dosed into the SCR system at a rate equivalent to 2-5% of diesel consumption. This low dosing rate ensures long refill periods, and the use of BlueDEF helps improve fuel economy allowing fleets to realize a reduction in overall operating costs. the urea solution. Therefore, it is essential to maintain high standards of diesel exhaust fluid quality and ISO standard 2224-1 is in place to insure fluid quality. BlueDEF is manufactured in accordance to these strict standards giving you the peace of mind you need using it in your SC System. Storage temperature between 40º F and 80º F is recommended to maintain shelf life. Storage temperature above 12º F is recommended to avoid crystallization, which starts at 11º F. Prolonged storage above 86º F will cause hydrolysis to occur, with the consequent formation of ammonia and pressure rise, and will reduce shelf life. reduce the levels of NOx emissions of those engines. exhaust gases to convert to nitrogen and water. What is BlueDEF made of? BlueDEF is a high-purity, 32.5 strength urea solution and deionized water. Yes, It needs to meet the ISO 22241-1 quality standard. Does it need to meet any quality standards? No, BlueDEF is not hazardous. The EPA has mandated the reduction of NOx emissions by the end of the 2010. What has changed to make BlueDEF necessary? BlueDEF is stored in a designated tank on the vehicle. It is then replenished like fuel. How will BlueDEF mix with fuel? before the catalytic converter effects the breakdown into nitrogen and water. How much BlueDEF will I need? BlueDEF is consumed at a rate of approximately 2 – 5% by volume to diesel consumption. When and how is BlueDEF available? It is available through Old World Industries and our distributor partners.